Peter Falk passed away last month and obituaries SUCH AS THIS ONE IN THE LOS ANGELES TIMES documented his varied career while noting he was most famous for playing Lt. Columbo, who wore a rumpled raincoat but had a sharp mind. We thought we’d take some time out to detail a couple of enounters the character had with spies. In “Identity Crisis,” in 1975 from Columbo’s fifth season on NBC, the murderer Columbo pursues is Nelson Brenner. The CIA operative is played by Patrick McGoohan, who seems to channel his John Drake and Number Six personas. McGoohan, who also directed the episode, was back for his second turn as a murderer on the show. McGoohan even works in his “Be seeing you!” line from The Prisoner. The script, by Bill Driskill, is pretty complex. The murder victim (Leslie Nielsen) is another agent. There’s a non-existent operative named Steinmetz and….well, you get the idea. Brenner has a cover identity as a business consultant. At one point, the CIA director (David White) pays a visit on Columbo, telling him to can his investigation in the interest of national security. 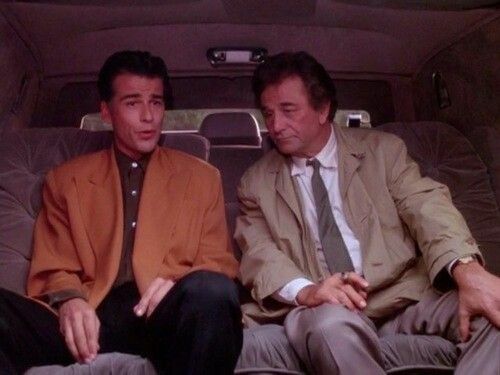 Columbo, of course, doesn’t give up that easily but knows it’ll be even trickier to bring in Brenner. 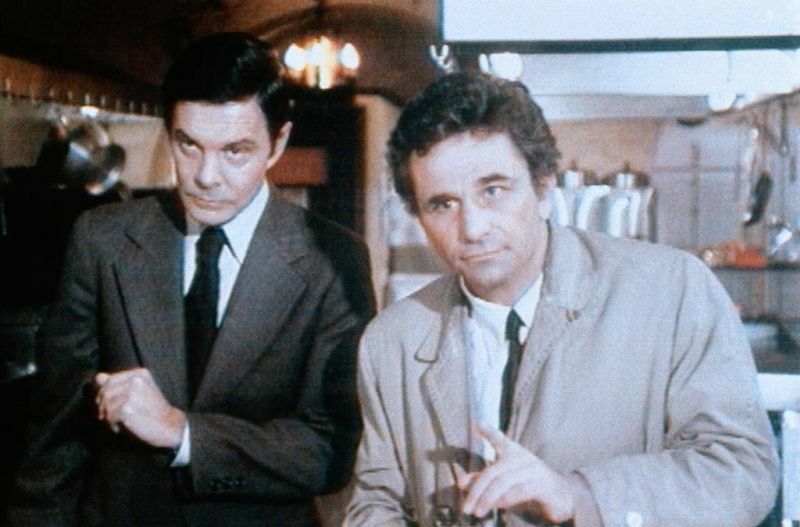 The CIA shows up in a more indirect role in “Columbo Goes to the Guillotine,” the first Columbo to air on ABC when the show was revived in 1989. Elliott Blake (Anthony Andrews) is trying to convince the agency he’s a genuine psychic who can be of aid in intelligence work. The CIA hires a magician, Max Dyson (Anthony Zerbe), who has also exposed other psychics as frauds, to test Blake’s abilities. The two men, however, have met before. They were in a prison in Uganda years earlier. They meet the night before the test and rig it in Blake’s favor. Afterward, Dyson says he agreed because of what the two mean to each other while in prison. Blake, though, knows that Dyson sold him out to get out of that prison. He kills Dyson, making it appear the magician was killed in an accident involving a guillotine trick. Columbo engages in his usual cat-and-mouse games with Blake. Meanwhile, the CIA’s Mr. Harrow (Alan Fudge) is convinced Blake is the real thing. The agency is ready to whisk Blake away with a new identity. Columbo, armed with a court order, prevents that. He duplicates the Dyson-Blake test, ending the CIA’s interest in Blake.